Help others have a great time while you’re having a great time. 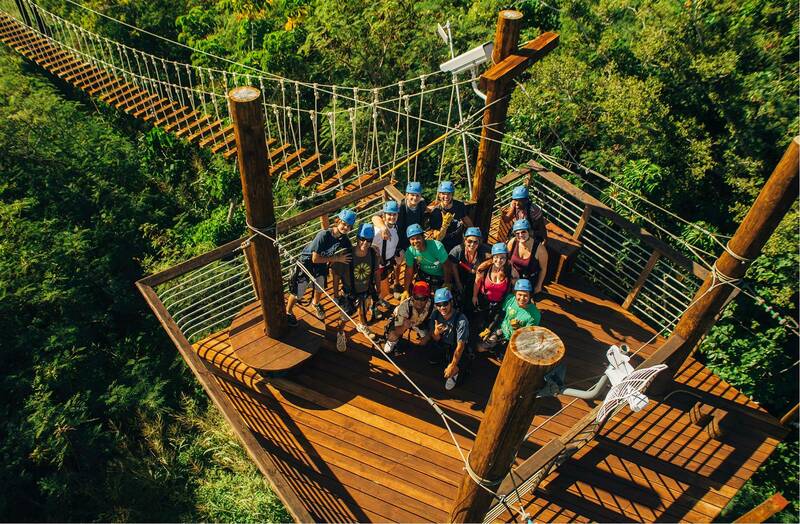 JOB OVERVIEW: Lead groups safely through our zipline course on the North Shore of Oahu while educating and interacting with customers to provide a fun and memorable experience. Success in this role looks something like this: You show up to work on time fully clothed and looking professional. Once at work you talk story with customers in a friendly and encouraging manner. 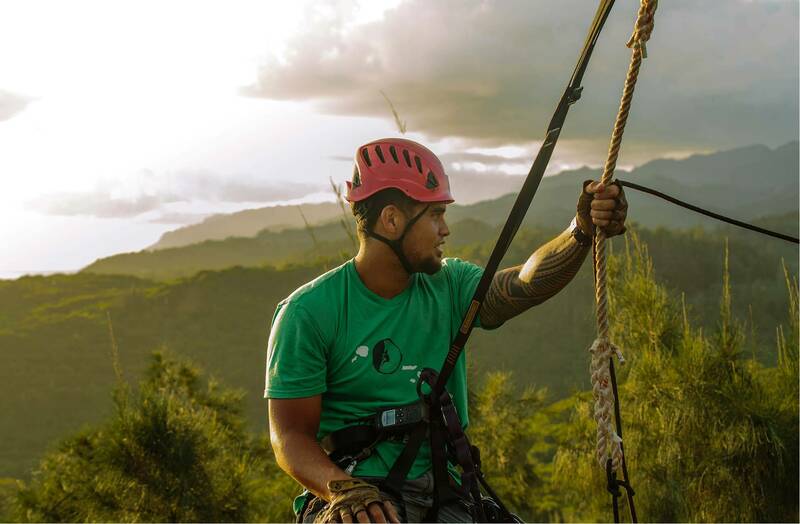 You also help them with their safety harness, helmet, and other gear before safely taking them through our 3-hour zipline course while sharing knowledge about Hawaii history and culture. Along the way you learn their names, where they are from, interests, and fears. You help them overcome challenges. You encourage them and probably tell some corny jokes. You are sincere and genuine in conversation. Once the tour is over and everyone gives sweaty good-bye hugs to each other, repeat the process. If you are a student, please describe your current class schedule. I understand that this job requires me to work more around holidays and in the summer. **Note: June through mid-August, Labor Day weekend, Memorial Day weekend, Thanksgiving, and Christmas through New Year’s are especially busy; we are closed every Sunday as well as Thanksgiving, Christmas Eve, and Christmas Day. I certify that all of the above information is complete and true. I understand that false information may be grounds for not hiring me or for immediate termination of employment at any time in the future. Must be at least 18 years old OR graduated high school; Positive attitude; Professional; Ability to consistently start/carry on a comfortable conversation with strangers; Ability to naturally command the attention of a group of 10-12 people; Ability to make a good first impression and instill confidence in others as a safe tour guide; Ability to connect with people from all backgrounds and with considerable personality differences in order to meet their needs; Serious-minded when it comes to safety; Enjoys working outdoors; Being physically fit enough to stand for a long period of time, able to pull yourself 100 ft on a zip line, and generally fit enough to instill confidence in customers that they will be taken care of in this potentially dangerous activity. Greet customers upon arrival; Engage in friendly conversation with customers; Equip customers with proper safety equipment; Instruct customers on zipline safety equipment and course safety; Gain trust of customers through expertise, personality, and professionalism; Lead group of 10-12 people safely through 3-hour zipline course; Hook customer safely to zipline course; Teach customers about surrounding area’s history, interesting facts, and company’s eco-friendly practices; Help customers overcome fear of heights through positive encouragement; Promote camaraderie among groups; May answer phone calls regarding schedule, general questions; Schedule groups using scheduling software; Maintain cleanliness of facilities inside and outside; May maintain premises, i.e. watering, staining, trail clean up, etc; Safely drive groups two miles up to the start of our course in a Polaris Ranger.